Objective: The aim of this work is to investigate the inhibitory effect of Plasma Activated Medium (PAM) on Head and Neck cancerous cells (FaDu). The response of FaDu cells in monolayer cultures and Multi Cellular Tumor Spheroids (MCTS) after treatment with different PAMs will be compared. Background: Head and Neck squamous cell carcinoma is a widespread cancer that responds poorly to anticancer treatments such as chemotherapy and radiotherapy. Nowadays there is a growing interest in cold plasmas and their applications in cancer therapy. Methods: A homemade helium plasma jet is used to produce PAM. The effects of PAM and hydrogen peroxide H2O2 on FaDu 2D cells cultures and MCTS were characterized by evaluating the cell viability with PrestoBlue test and by measuring the size of MCTS. Results: One treatment with PAM induce cell detachment from MCTS since the first day in a PAM exposure dependent manner. This is due to the presence of H2O2 in PAM. However, a rapid spheroids regrowth is observed attributed to a resistance of FaDu cells to H2O2. After multiple treatments of MCTS with PAM we obtained an inhibition of cell growth. MCTS are brought out when comparing PAM effect on 2D versus MCTS. Inversely, PAM induces cell death in the case of 2D cell culture. Conclusion: PAM may be considered as a potentially efficient agent in the therapy of head and neck cancer. We also point out that MCTS is a more valuable model than 2D cell culture for the evaluation of the anti-cancer activity of PAM. Keywords: Plasma medicine, head & neck cancer, FaDu, plasma activated medium, hydrogen peroxide, cell viability, multi cellular tumor spheroid. Keywords:Plasma medicine, head & neck cancer, FaDu, plasma activated medium, hydrogen peroxide, cell viability, multi cellular tumor spheroid. Abstract:Objective: The aim of this work is to investigate the inhibitory effect of Plasma Activated Medium (PAM) on Head and Neck cancerous cells (FaDu). 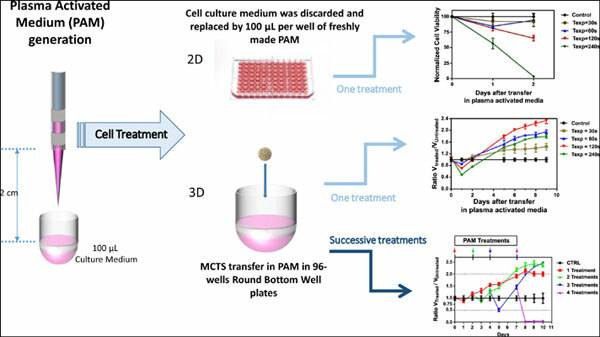 The response of FaDu cells in monolayer cultures and Multi Cellular Tumor Spheroids (MCTS) after treatment with different PAMs will be compared.